Travelling around using trains in Spain is both cost effective and stress free and can be considered in many cases as a viable alternative to Flying! All Spanish trains are Clean, safe and punctual! Spain enjoys a wide range of train types and counts both domestic and international connections in its network and it is possible to cross Europe from Spain by train! 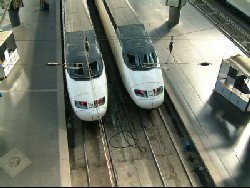 Of these three types the High velocity Spanish train network is expanding year after year with the Levante coast of Valencia and Alicante due to join Antequera, Barcelona, Cordoba, Huesca, Madrid, Segovia, Sevilla, Valladolid and Zaragoza in receiving high speed trains in 2012. After 2012 an international connection to Portugal via Extremadura as well as services to Northern Spain are due to come online. 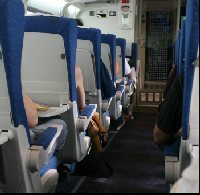 The Spanish intercity trains offer the same levels of comfort as high speed trains although travel on slower / normal tracks. These are also some of the most scenic options as the routes wind through the mountain ranges of the North and Central Spain or accross the interior plains. Regional trains in Spain connect destinations within 3 hours of one another and tend to be a "stopping" service that passes through every small village along the way. For longer journeys on a budget eg Madrid to Barcelona it is possible to take two regional trains as a far more cost effective means of travel, of course the journey time is around 8 times longer as well! All the differing types of trains in Spain are heavily subsidised by the Spanish government and this helps to make them one of the cheapest ways to travel in Spain! Internet ticketing means that before leaving home you can have your whole journey planned, booked and even ticketed! Important: Domestic Trains in Spain can only be reserved via the official Spanish train ticket website which is that of Renfe. There are a number of websites that allow you to reserve tickets from the USA but these apply significant mark ups and can be considered as nothing more than "ticket scalpers". Spain enjoys three principal connections to its near neighbours France and Portugal. International trains bepart from Madrid and Barcelona (with stops along the way at major cities) to final destinations of Paris, Marseille and Lisbon where onward connections can be made to the rest of Europe. These services are run by the national rail companies of each country via a holding company called Trenhotel and offer a semi luxury to luxury train service depending on the class of travel that one reserves. International trains in Spain can be cheaper than flying! Operating in the North of Spain these Luxury trains are tailored 100% to the tourist and involve stopping at a number of hotels in major tourist destinations en route. Famed for their high level of service these trains are Spains equivalent of the famous Orient express. Needless to say tickets for these pre determined journeys are of a comparable price as well! Departures are only on certain days of the year and with a fixed itineries which are normally publidhed in October / November of the preceeding year. Although very popular the services rarely sell out completely but if you want one of the higher classes of travel it is recomended to reserve beore March of the year of your travel as these classes have limited availability. Routes: The two principal routes can be connected to form one continuous journey however for the purpose of this page its worth considering them as seperate trips. Starting at either end of the route one pases through the green mountains and culturally rich Basque country, Cantabria and Castilla y Leon. Total journey time is 4 days in one of the premier luxury trains in Spain. Covering the ancient kingdom of Castilla and Leon before journeying into the mountains of Northern Asturias and finally terminating in Galicia this trip is bookable in either direction. Also taking a total of 4 days one can relax aboard the train or dismount in one of the many cultural city stops along the way.